Paper tends to mess a place up. We had our paperwork spread out in different locations around our house and decided to do something about it a few years ago. We have a very small house. It's only 82 square meters plus basement (882 square feet somebody translated it to) so there's no room for a home office in a room of it's own. We built a unit smack in the hallway. It's basically the first thing you see when you enter our house so I knew it had to be pretty or I couldn't live with it. I posted the three first photos below on Flickr and judging by the number of faves they got our little unit is a success :). This was the first version to hit Flick'r in December and so far it's my most faved photo there with a whopping 145 faves! The pink version was only a very brief one. We're not pink people. A lot of you like it tough, It was faved 68 times. This is basically how it looks now, with a few minor changes. 93 Flickr faves and I guess our fave too. On the desk is where I keep the laptop and it's where I'm writing this. Here are some close up's so you can see what's inside and what goes where. I divided one of the cubbies into four slots. We have one each and there's one for bills to be paid. When I get mail I immediately sort it. Throw all junk mail in a trash can (which you can see in the pink photo) which I empty into a recycling bin evey week. I then put the bills in the bill slot and and any magazines or catalogs in a reading pile by the sofa in the livingroom. All other paper bits or mail laying about go in our individual slots. Again almost all white storage. To me it just looks the best and doesn't draw attention to itself in other ways than looking neat and tidy. I got these two divider thingys at a fleamarket and they are both a nice aqua color and extremly useful. As you can see they're holding and hiding a multitude of not so pretty office supplies. I wasn't sure I'd show you these... As bloggers were starting to blog my photos and as I was getting requests for house tours I printed them out... There are now two files... I feel a little embarrassed but it's a good ego boost if I ever doubt myself. I have three boxes for hanging files. I use one for user manuals and warranties. There's one file for all things related to our bikes, one for cameras, one for the TVs, one for kitchen appliances and so on. The other two are for bills, taxrelated thing, insurance papers etc There's one file on the cats, their vet bills, shots and insurances. One regarding the boat, one with my air mile statements and one each for Martin and me with pay slips. Basically anything we want easily found has a hanging file. Inside of the hanging files I divide the papers into plastic files. For example each insurance company has a file within the "insurances" hanging file. 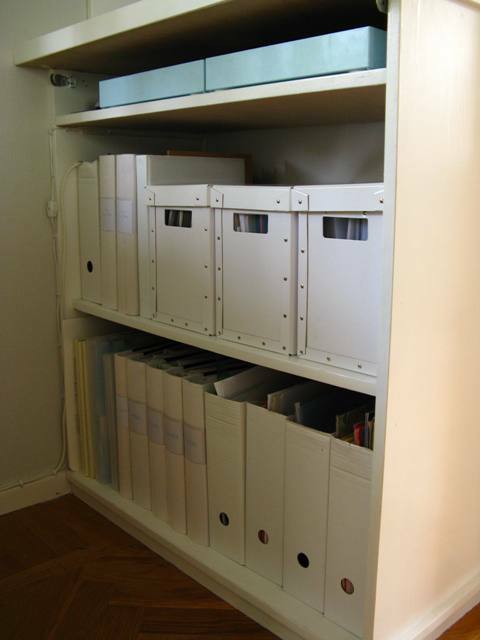 These files are for personal papers like certificates, grade reports, documents etc. There's also one for papers related to the house and one with the camera manual which I want easily accessible as I'm still learning. At the bottom of the unit I have some magazine files where I keep large envelopes, plactic files, colored papers, stationary and local maps. It takes a little effort to get all the papers organized in the first place but once you've done it it feels sooooooooo good and works really well. You can do it too!! It's no secret that I love Martha Stewart. In the beginning I contacted somebody by the name Amy Shuler at the magazine's head offices and sent her money orders so she'd send me the magazines. Later on I was able to get an international subscription and since quite a few years we get "MS Living" in our local shops here in Sweden. I'm proud (ha!) to say I have very single issue and I never (never ever!) tear anything out of them. Those "Living" mags are probably the one collection that will stay with me forever. Not that they're worth much monetarily but because I keep getting inspired by them. Constantly. I have to say that apart from "Living" my all time favourite was "Blueprint". It was very Martha but in a younger more contemporary way. Martha, don't get me wrong, but your personal decorating taste is a little bit more grown up than mine. Martha inspires me all the time (I was going to say daily but that sounded too scary). If in doubt, what would Martha do? Cleaning tips? I check her homekeeping handbook. Organizing inspiration? I find the perfect article in the magazine. The list goes on. The one topic I skip: Cooking. Martin cooks. I clean. Do I need to add I tape her TV show? It's on at the weirdest hours over here... Wille and I are off to New Your City at the end of August so if they're taping, I'm getting tickets. Wille claims he's happier in the hotel room. But I'll change his mind. For sure! The photos are from Martha's website, another great source of inspiration. Oh deer, we're being given away! Those of you who read last night's post on the cabinet downstairs may have noticed I didn't mention where I put the thrifted cross stitch art. That's because I've definitly decided not to hang on it anymore. If any of you would like them they are up for grabs absolutely for free. I'd be happy to send them anywhere in the world (free of charge) where they will be more appreciated than in my own home. Don't get me wrong, I think they are lovely, that's why I got them in the first place last summer, but I've tried to find a spot for them and still haven't . Better to let them go. If you are interested, the size is about 45x35 cm or 17.5"x13.5" on both. One is glued to a cardboard backing and the other one is loose so that one could be made into a cushion front I guess. As far as I can tell they are made of wool yarn. If there are more of you wanting them I'll make it a lucky draw on Sunday morning (my time). Let me know in the comment section if you're interested. Be sure to include your e-mail address or check in on Sunday so I can announce who gets them and can get in touch.